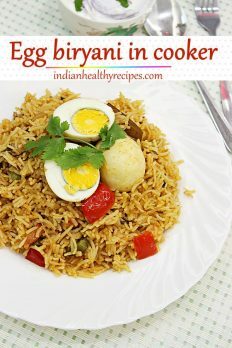 Egg biryani recipe – fragrant rice cooked in aromatic biryani spices and boiled eggs to yield a delicious one pot egg biryani. 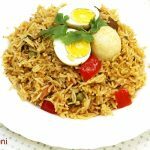 This is one of the most easiest, delicious and flavorful biryani that one can make at home with very few ingredients. Best to prepare when running short of time and desiring to have a special meal. Any raita varieties like onion raita or mint raita with some papads will go well with this. 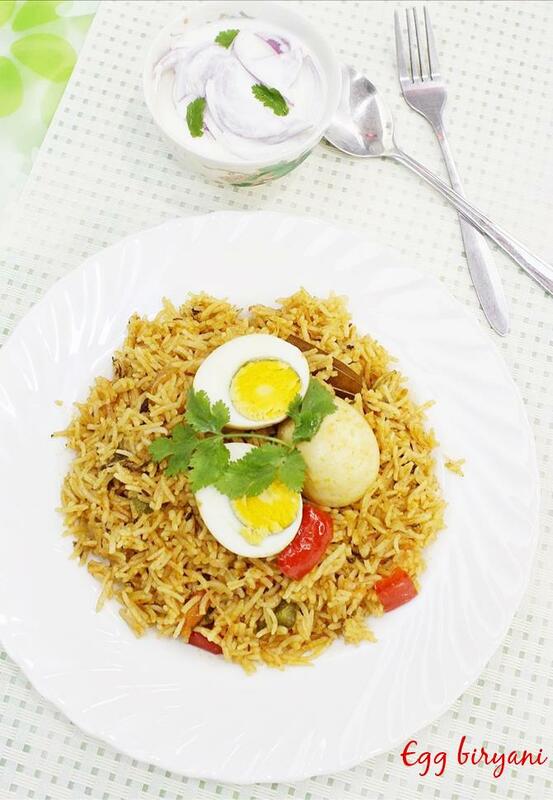 This is not a dum biryani, but tastes great with good flavors and can be prepared in a pot or in a pressure cooker. Potatoes and capsicum are 2 ingredients that add flavor to this one pot egg biryani. However I have made this time time without potatoes. 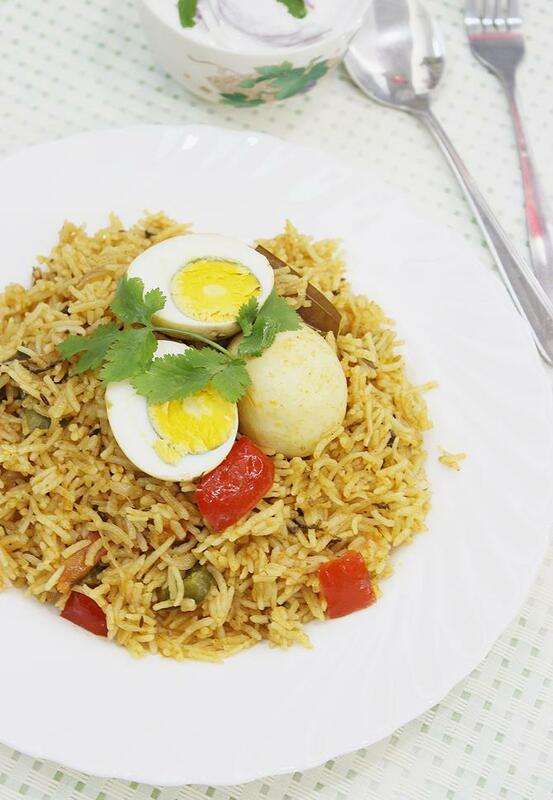 To make a best egg biryani, the use of best quality fresh spices and masala powder is very important. I have used this homemade biryani masala powder. You can also check this easy Chicken biryani. 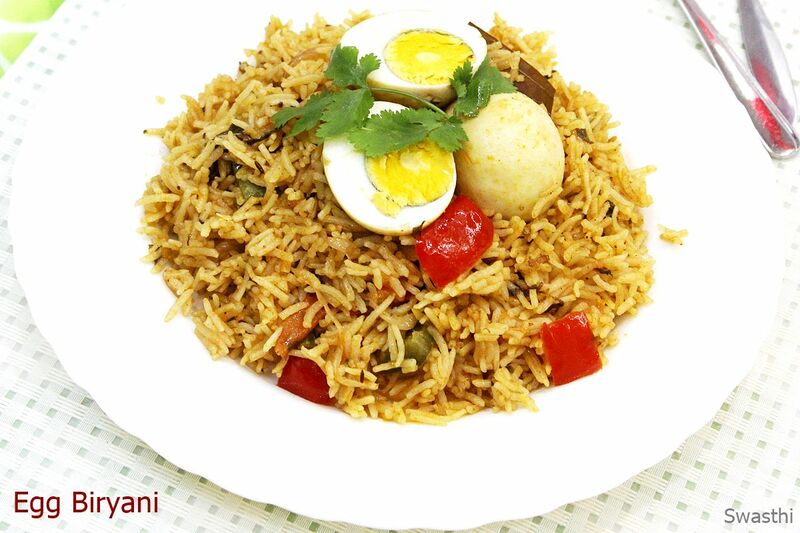 One pot delicious egg biryani made with basmati rice, boiled eggs, spices & herbs. Serve this with a raita. Soak rice for at least 20 to 30 mins. Drain water and set the rice aside in a colander. 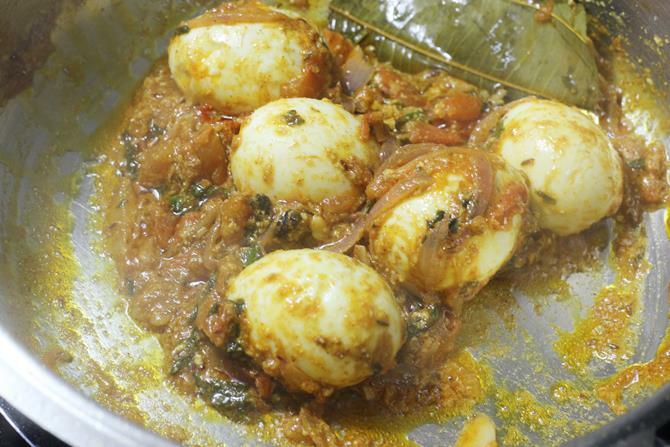 Boil eggs and remove the shells and wash them. Make few gashes using a knife or a fork. Set aside. Heat a pressure cooker or a pot with oil. Add capsicums if using and fry on high for 2 to 3 mins. Set these aside. 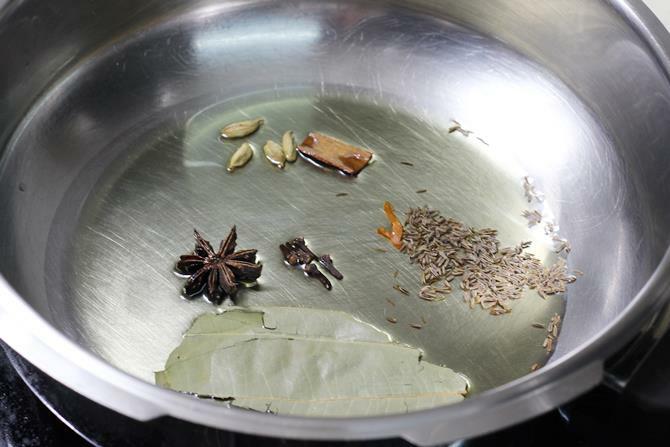 Add star anise, bay leaf, shahi jeera, cardamoms, cloves, cinnamon and mace. Allow them to sizzle. 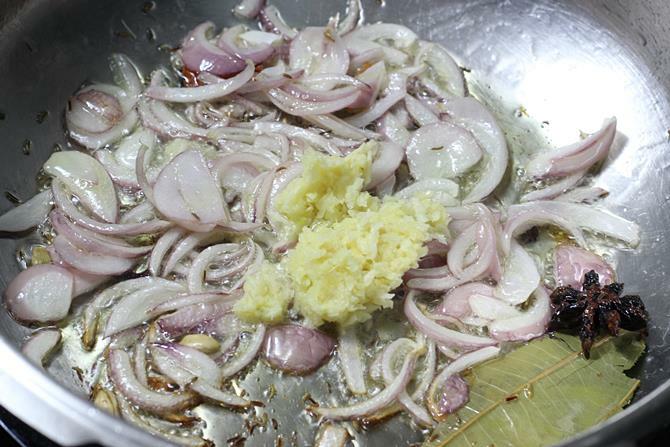 Add onions and fry till golden or light brown. Add ginger garlic paste. Fry till the raw smell goes off. Add eggs, potatoes (if using) and biryani masala powder. Fry till the mixture thickens. Pour water and add salt as needed. Taste to check for salt and spice levels. Bring it to a boil. Add rice and capsicums. Cook rice in open pan till very little water is left. Lower the flame, cover and cook till the rice is done fully. If using pressure cooker, close the lid and cook on a very low flame for about 5 minutes. Switch off before it whistles to prevent it from becoming mushy. Set this aside, don’t leave on the hot burner. Fluff up the egg biryani and serve with raita. 1. Boil eggs, shell them and wash. I prick them with a fork randomly. Set aside. 2. Heat a pan with oil, fry capsicums for 2 minutes if using and set them aside. Time to add dry spices cinnamon, star anise, shahi jeera, cloves, bay leaf and cardamom. 3. When they begin to sizzle, add onions and green chilies. Then fry till lightly golden. 5. 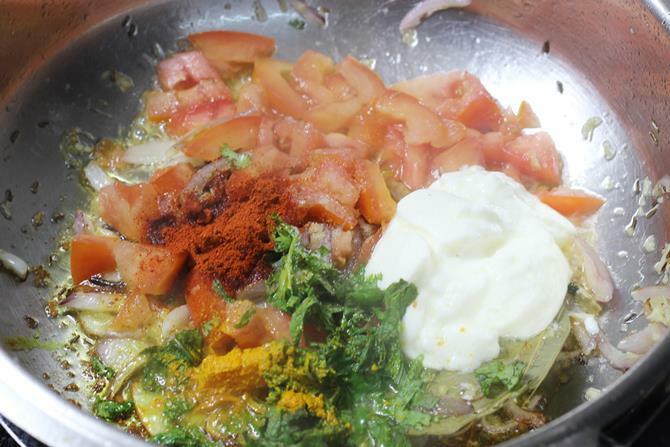 Add tomatoes, turmeric, red chili powder, salt, yogurt, coriander and mint leaves. Mix and cook till the tomatoes become mushy. 6. Add the eggs and the biryani masala powder. If you wish to use potato, you can use at this stage. Mix well and cook until the mixture thickens and begins to leave the sides of the pan. 7. Pour water and adjust salt if needed. Bring the water to a boil. 8. Add rice, fried capsicums (if using) and cook till the rice is cooked fully. 9. 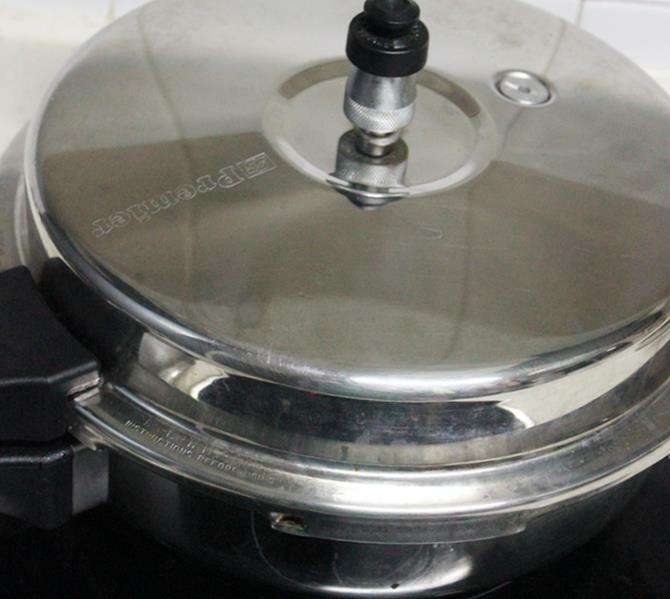 If using the pressure cooker, when the rice is half cooked, very little water is left as you see in the picture above, close the lid and cook on a low flame for 5 minutes. Switch off before it whistles. Set aside to cool. If you wish to have a mushy and soft biryani, allow to whistle. If you are using normal rice, let it whistle once. 10. Fluff up biryani when you open the lid. Serve egg biryani with onion raita or a mint raita. Your blog is the reason why i started cooking 🙂 Step by step instructions is a big help for guys like me who don’t understand the science behind cooking. I just follow your instructions blindly and ending up with tasty food. Thank you for writing. Please keep it going. You are welcome. So happy to know the recipes are useful. Thanks a lot. Sure! I will keep posting. Tried the egg biryani last Sunday.yum.the potatoes and the capsicum made a big difference. Awesome recipe Swasti. Tried once, it came out very well. It was tasty yummy.. every one liked at home. Keep it up. Which rice and how much water did you use? I made this it is very tasty.thanks for the recipe. 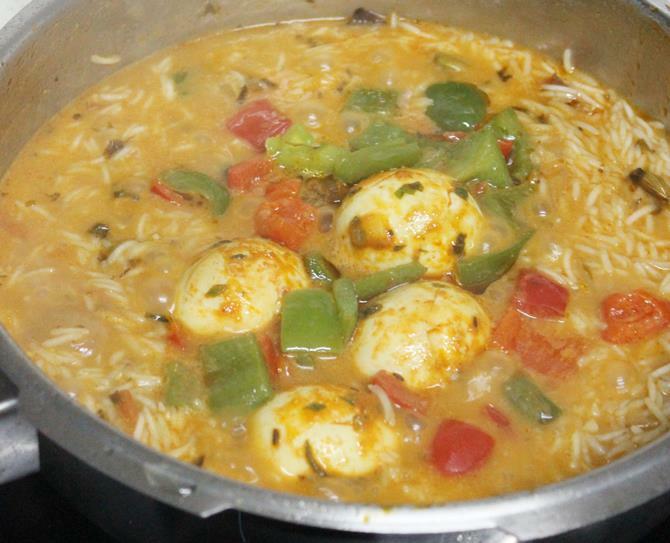 Super… tried this recipe today.. thank you.. Tried this today, and it came out super gud? Thanks for all this recipes..
Glad to know egg biryani came out well. 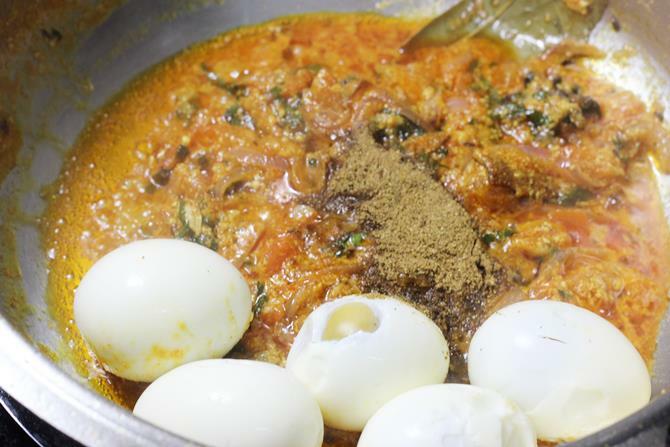 I tried this recipe many a times using regular rice & basmathu rice and it came out well. But recently i tried using Brown Basmathi rice and the output was disastrous. It took double the amount of time and water but still the rice was half cooked even after 2 hrs, so fixed the cooker and had to let it whistle but the rice got over cooked. Taste was good but rice almost became like khichdi. I have no clue what’s with Brown Basmathi. Need your advice on how to cook this rice further. Cooking with brown basmathi requires a bit of experimentation.I mostly use brown basmati for make mushy rice dishes like bisi bele bath, sambar rice, curd rice, khichdi, masala khichdi etc. 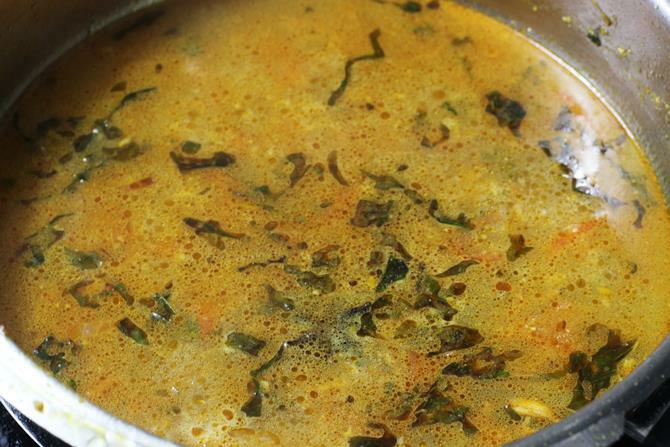 I sometimes use it mixing with white rice in equal qty to serve with sambar or dal.. I always soak rice for 2 hours. I wash and soak in warm water as this helps to soften the husk.